Lusso Maui Ocean & Golf View Villa! VISUALIZZAZIONI!! $ 179 + Prezzi stagionali e speciali! La nostra villa ha una magnifica vista sull'oceano ad un prezzo incredibile! Godetevi la vista panoramica mozzafiato del nostro racconto singolo Golf Villa a Kapalua. Si tratta di un ampio appartamento con una camera da letto (circa. 1.000 m²) con un mazzo enorme (circa. 400 sq. Ft) che è grande per i tramonti, mangiare all'aperto e prendere il sole. La villa è dotata di aria condizionata e completamente arredata, con un nuovo letto Cal King-size, ampia chaise longue, due bagni, lavatrice / asciugatrice full size, due TV a schermo piatto e DVD con connessione Wi-Fi gratuita. La nostra villa dispone anche di una cucina completamente attrezzata e una delle 4 piscine situati nelle vicinanze. Ammirate i tramonti spettacolari, ampie vedute di acqua bianca sul mare e Kapalua Bay Golf Course e una splendida vista sull'isola di Lanai dal ben attrezzato ponte / patio. NON CI SONO TASSE resort o tasse di parcheggio !!! La nostra villa è situata accanto a uno dei due campi da golf di classe mondiale Kapalua: The Bay Course e The Kapalua Plantation Course. Quattro delle top rated spiagge di sabbia bianca del mondo e diversi ristoranti favolosi sono pochi secondi di distanza tramite navetta gratuito e una bella passeggiata. Siamo molto vicino ad alcuni dei migliori snorkeling a Maui !! Non esitate a leggere le recensioni qui sotto. Molte delle recensioni sono da ospiti che hanno restituito ogni anno per la nostra villa per la loro vacanza in paradiso !!! What a great place to stay!!!! Our stay at the Kapalua Golf Villas was wonderful! The condo was very comfortable and clean. When I walked in the door my first thought was "Wow!. We had a view of the ocean from the lanai. I would recommend staying at this condo to anyone who want a quiet and relaxing place to stay and still be so close to lots of great restaurants, places to shop, and in the middle of a beautiful golf course. Thank you so much for letting us stay at your excellent condo. We can't wait to go back! Thank you Judy! That ocean and golf course view is exactly why we purchased our villa! It takes our breath away every time we see it. 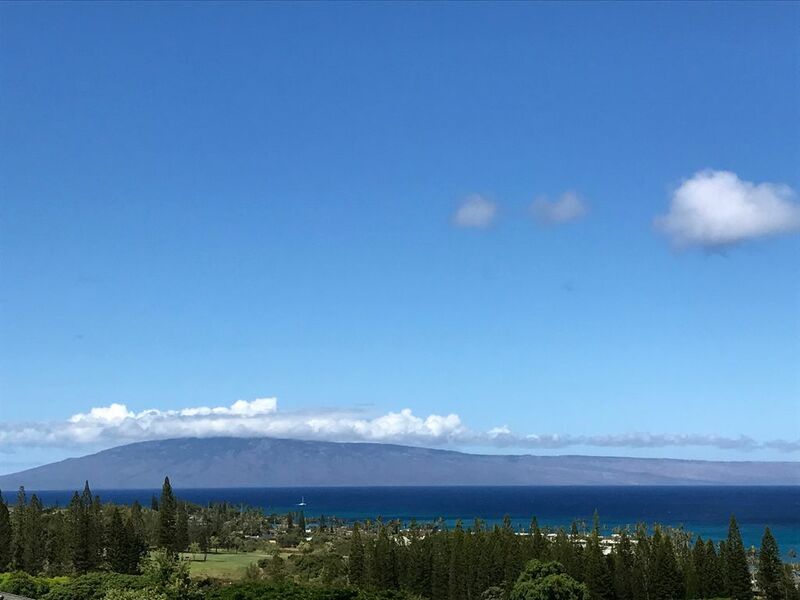 We also love that we can walk to the beach or to golfing, tennis, hotels and restaurants yet be in such a peaceful area of Kapalua! Thank you for being such a wonderful guest and we hope to have you again soon! This was our second trip to Maui and our second time staying in this complex. The large lanai and the views can't be beat at this price point. Kapalua is expensive but Joan and Andrew have managed to keep their pricing very reasonable for the area. They were wonderful to deal with and went above and beyond to accommodate us during our 12 day stay. Only reason we can't give it 5 star rating would be the constant noise from the unit directly above us (not fault of Joan & Andrew) but just took away from the overall relaxing vacation experience. We would recommend this unit to anyone looking to rent in the area. Oh Richard! We are so surprised to hear that it was noisy as we have never had that complaint before in the 6 years we have owned our villa. We wish you would've mentioned it to us during your stay as we would've contacted the owners for you. We enjoyed having you as guests and we hope to have you again! My fiancé and I stayed here for a week and could not have been happier. Short walk to a number of pools within the condominium area and a few really nice restaurants and bars. Easy access to a walking path along the beach that connects a couple of beaches. The condo itself has a nice lanai overlooking the golf course and ocean good for laying out in the sun. Would definitely stay here again. This is a great little Villa up on the hill with easy access to just about everything. Great base to explore West Maui by bike or car or foot. Easy walk to Sansei (great sushi) and easy access to everything else via shuttle or quick car ride. The villa is very quite large. The master suite is a big with a nice King size bed for lounging when you don't want to be out on the big lanai taking in the sunset. Lots of restaurants nearby and great beachs are plentiful. As much privacy as you want for quiet times. Of course there's a pool too if don't like beachs (but why are you in Hawaii?) but there are those times when a pool is nice :) Everything you need for a nice visit. We highly recommend this little gem for quiet getaway. Thank you Jon for the nice review! It makes us very happy to have such great repeat guests as you and several others over the years. We too enjoy walking to the several beaches as they are some of the prettiest in the world! Joan and Andrew's Golf Villa is wonderful! We have stayed here at least 3 times and find the updates that were done since our last stay, are very well done. As others have said, the condo is well furnished , has a great view and is near good restaurants (Pineapple Grill, Merriman's, Plantation Restaurant to name a few), and convenient to both the bay golf course (it overlooks this course) and the Plantation course just a few miles away. Joan and Andrew are delightful to work with and the unit is very reasonably priced. I don't have to say that we will be back, BUT WE WILL! Highly recommended. Thanks you two! We've enjoyed having you stay over the years as we know how much fun you have in our little Hale! Second Visit -- Another Great Experience! This is our second time staying in this condo, and it was even better than the last time! Like last time, the condo was extremely comfortable and clean. The kitchen was well-equipped, and we had everything we needed to cook up lots of local fresh fish and farmer's market fruits and veggies. We really appreciated that there were beach chairs and an umbrella for our use. The lanai is spacious and the gorgeous ocean view really cannot be beat. We also made sure to take advantage of the pool next to the condo, which was much less crowded than the other pools in the complex. We also love the location of this condo -- it's walking distance to some of the best snorkeling on the island (Kapalua Bay) as well as great dining and cocktails (Merriman's). The free shuttle was easy and very convenient for trips to the spas at the Montage and Ritz Carlton. We also enjoyed walking to the beautiful Kapalua Coastal Trail, where you can see the Dragon's Teeth, tide pools, and (occasionally) some sea turtles frolicking in the surf. Lahaina is a short 20 minute drive away (for delicious eats like Star Noodle and Ululani shave ice), and it's also a short drive to the natural, rugged northwestern side of the island, where you can find Honolulu Bay, the blowhole, and other amazing sites. Finally, Joan and Andrew are wonderful hosts and very responsive. This will always be our first choice for a place to stay when we visit Maui! It is always so nice to have you two back to visit as we appreciate how much you enjoy our place!! Mahalo!! La vista dalla nostra unità sono incredibili e tutto è convenientemente situato nelle vicinanze. Si può godere la serenità delle nostre lussureggianti dintorni o fare una passeggiata al alcune delle spiagge più belle dell'isola !! Il Honolua Store non è troppo lontano per una buona tazza di caffè o di godere dei loro deli e scorta di generi alimentari o regali. The Bay Course Kapalua è fuori la nostra porta di casa con il campo da range nelle vicinanze, così come sentieri con vista mozzafiato. Vi è anche un percorso a piedi di 3 buche e putting green accanto ai negozi range e resort! resort di classe mondiale, il Montage e The Ritz Carlton Hotel e Spa sono solo a pochi isolati di distanza !! Godetevi i loro musicisti locali nella Lobby o cenare in uno dei loro ristoranti meravigliosi. C'è paddleboarding a Kapalua e Napili Bay insieme con incredibile snorkeling e Boogie Boarding! Five nights to monthly rates...from $169-$375 a night depending upon season/events plus 13.4166% TAX and a $200.00+ check-out cleaning fee. Our unit has a high rating in the resort with many return guests and would rent for $500+ a night peak season through the hotel rental program. As private owners we can offer a more competitive rate. NO PARKING OR RESORT FEES!!! (Hawaii TAT Reg.# W04997975-01) The advertisers, car rentals or any suggested or posted websites on the bottom of this listing are not sponsored or listed by us as owners. They are part of HomeAway's marketing and are not our personal recommendations.